Ages ago, elves and dwarves unknowingly migrated between Universes via a Junction. Jenneva and Egam believe they have found a Junction and plan a trip with Alexander to test the theory and investigate the origins of the elves and dwarves. Because they believe that the perennial animosity between the two races is due to misunderstandings about their histories, the mages include the prince of elves and the prince of dwarves in the group. Trouble begins at the very start of the journey as Egam falters going through the Junction, awakening an old nemesis, the evil demon, Alutar. It appears that the excursion will not just clarify history, but actually change it. As the group discovers they are trapped in the new Universe, the shocking truth of the real history of the races is overshadowed by impending doom as an ancient prophecy begins to unfold. Meanwhile, the evil sorcerer, Sarac, not only gains freedom from his imprisonment, but also gains the blessing of the evil demon, Alutar. With the blessing, Sarac is given new powers and is promised a reign of a thousand years. The race is on to prevent Sarac from unfettered control of the Universes, as our trio stands incapable of altering the prophecy of destruction. More books by Richard S.
We will send Ancient Prophecy, Book 3 of the Targa Trilogy to your Kindle at . 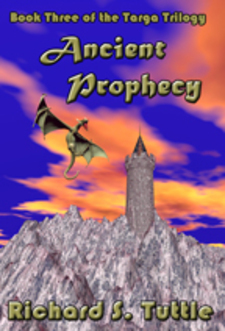 Ancient Prophecy, Book 3 of the Targa Trilogy has been sent successfully to your Kindle!